Who doesn’t love a fun wreath on their door this time of year? The problem is they cost more than most of the presents on your kids’ Christmas list, or they can take longer to make than a roasted goose. Not this one. Deck your door with Santa! I promise it’s a quick and not too expensive craft. I based the size of my wreath on what best fit my hat. I recommend taking your hat with you to pick out the wreath form to be sure it will fit. 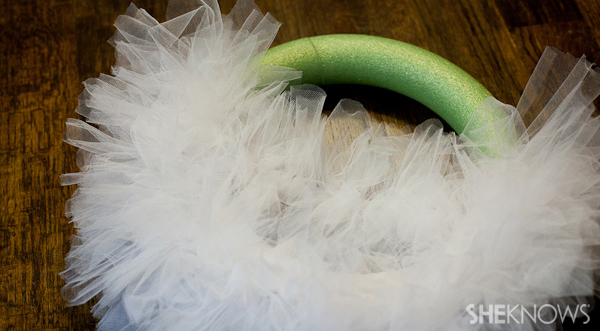 The easiest way to cut your tulle is to wrap it around a piece of cardboard that is 15 inches wide. Then cut down both sides of the board. 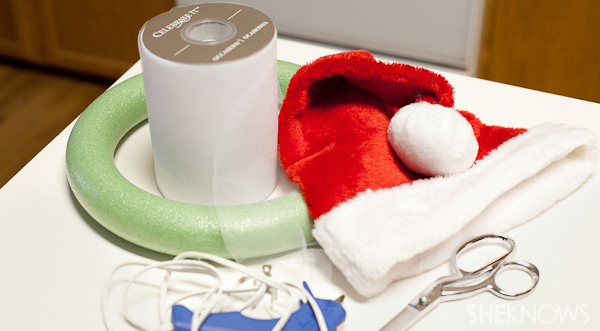 Start by putting your hat on the wreath and marking where it the bottom touches on each side of the wreath. 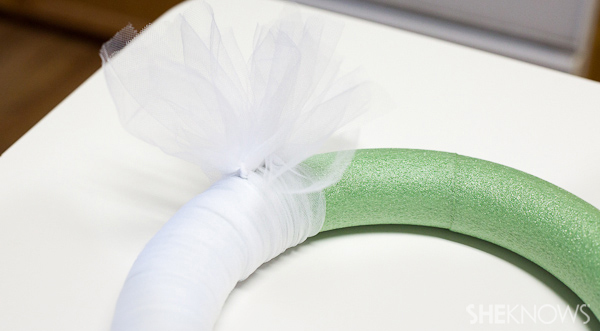 You’ll only need to tie the tulle between these two points. 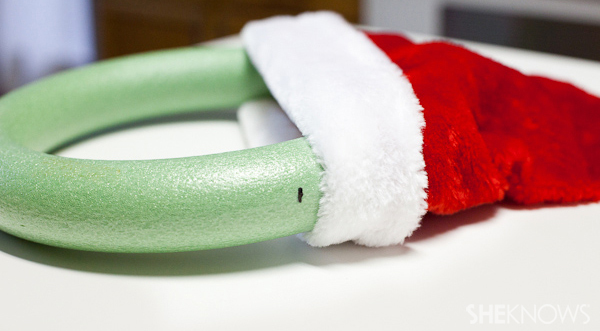 Simply tie your pieces onto your wreath with a simple knot. Continue this all the way around, from one pen mark to the other, until you get it as full as you’d like. 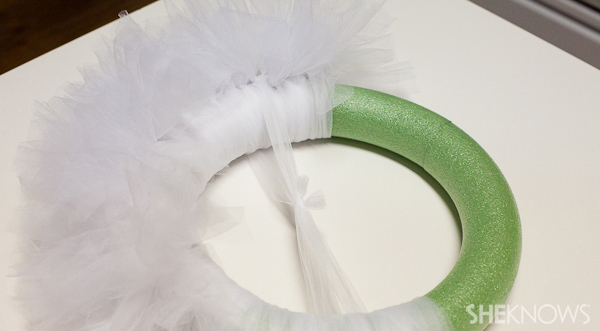 If you have a green wreath form, you may want to wrap it in some white tulle before you begin tying the strips on, just to be sure no green shows through. 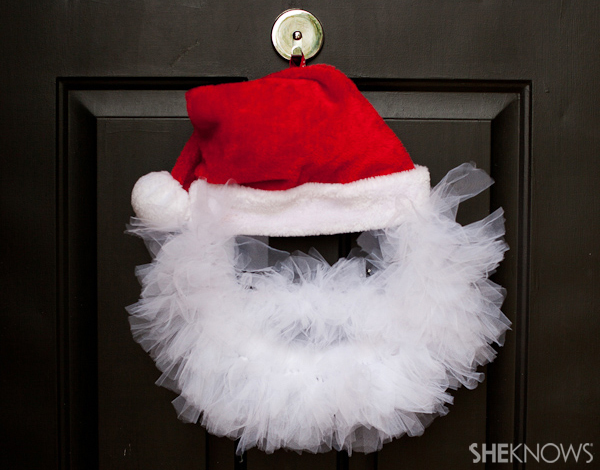 To add a mustache, tie a piece of tulle across the middle of your wreath about 2 inches below where the top of the beard will meet the hat. 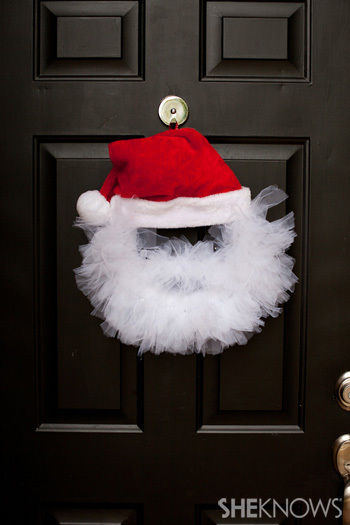 Cut your remaining 15-inch tulle strips in half, then tie those with a simple knot around the piece you tied across the middle of the wreath until the mustache is as full as you’d like. 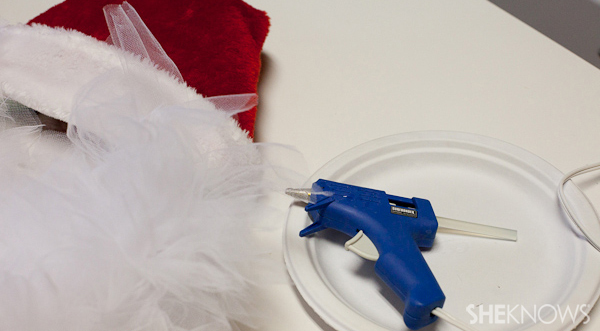 Finally, place the Santa hat on the top of the wreath and hot glue it into place on either side. To give the hat a little more fluff, I balled up and stuffed the leftover tulle pieces inside the hat. Then I hot glued the inside of the hat to the front and back of the top of the wreath. 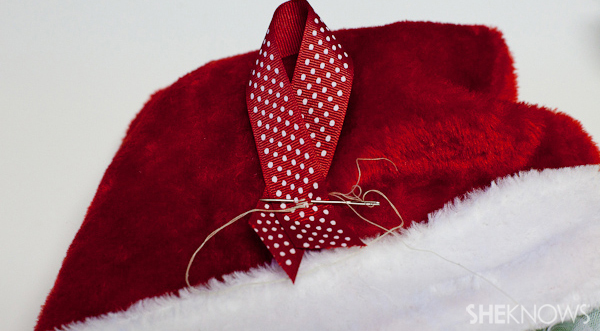 The best way to hang it is to stitch a scrap piece of ribbon onto the back. All that’s left is putting this guy on your door! Ho, Ho, Ho! Merry Christmas!